Well this Is unusual.. I'm blogging on my ipad for the first time ever! I literally have no idea how this is going to turn out.. and even though it's not quite as efficient as on my laptop, I need to try and make it work until my Internet gets connected. Basically, I purchased this EE wifi box but it's only powerful enough to power my phone and ipad.. Mine and Daniel's Macs have no chance ha! 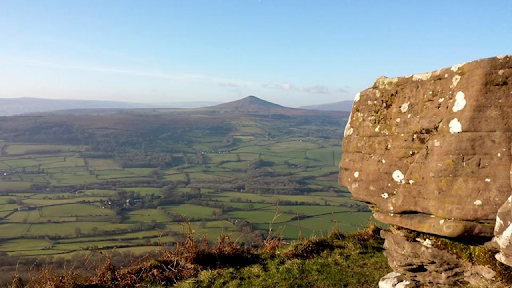 So, instead of taking Sunday as it comes and relaxing me, Daniel, my sister and her partner decided to quite impulsively climb one of the famous Monmouthshire mountains, also known as the Skirrid Fawr. Me and my sister didn't quite make the summit, as she has a huge fear of heights and there were a few more sudden drops than she expected. I decided to stay with her and let the boys climb to the summit, as I wasn't too fussed on falling over in the mud haha! We decided to enjoy the scenery from where we were, which I'm glad as we did make it quite high and we had loads of laughs, whilst making friends with many passers by! My sister said that I looked more prepared for the alps than a crisp welsh walk which made me laugh! 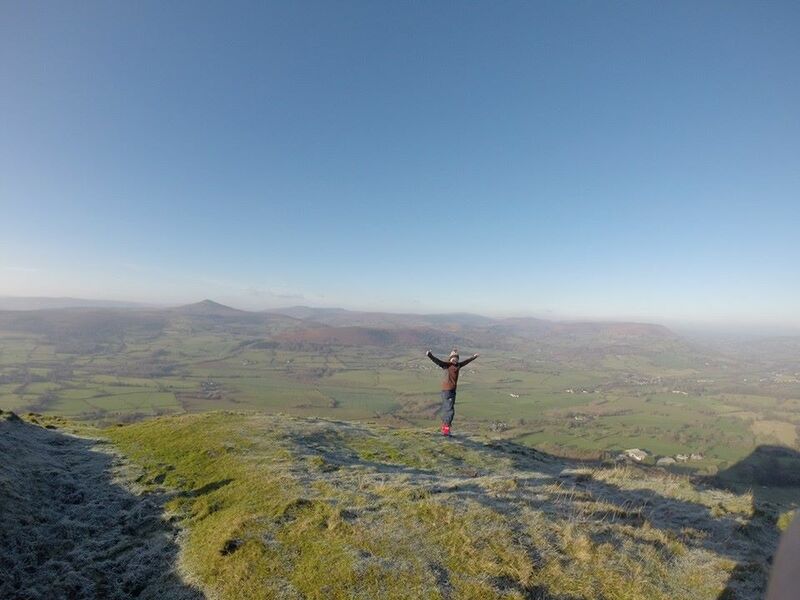 You can probably tell I'm not a mountain walker from this post, but hey! I gave it a go. I thought I would include a OOTD and a what's In my bag, which was far from a traditional hiking backpack! Anyway, I hope you enjoy this post lovelies and I would love to hear from you in the comments section down below. 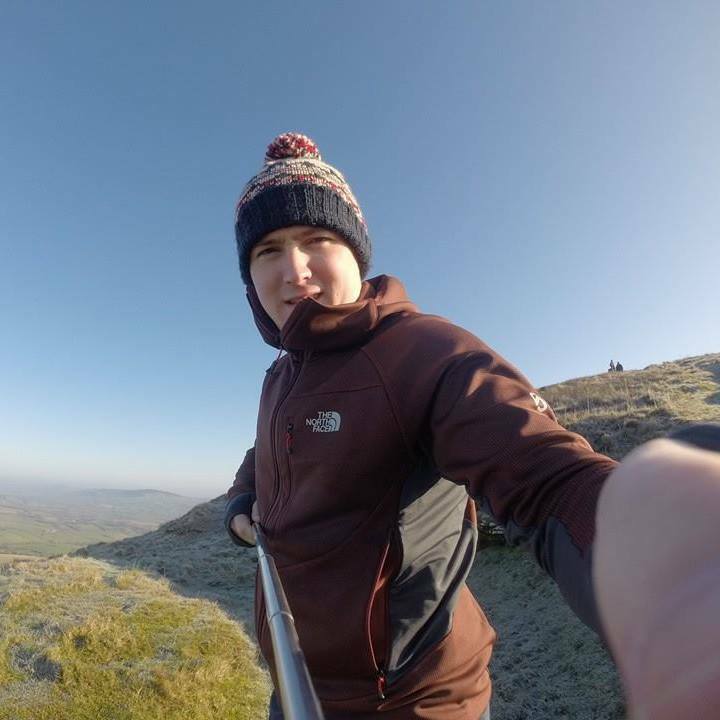 I thought I would go ahead and include a quick OOTD, as well as showing you my beauty essentials for mountain walking haha!! Can you tell I don't do this very often? I decided to take a few beauty bits with me, as there was a chance we would be popping to town after the walk.. which never actually happened, but hey I was prepared for a beauty dilemma half way up a mountain! Firstly, my Benefit POREfessional found its way in there as it was already in my bag from another day. I also took my Bobbi Brown Touch Up Foundation Stick, which is all in the name! It's great for quick touch ups and it doubles up as a great concealer too. I seem to never be without one of my all time faves, which are my Chanel Rouge Coco Shines and the shade I had was Secret, which is a beautiful muted Pink. Now onto what you might class as more mountain appropriate! 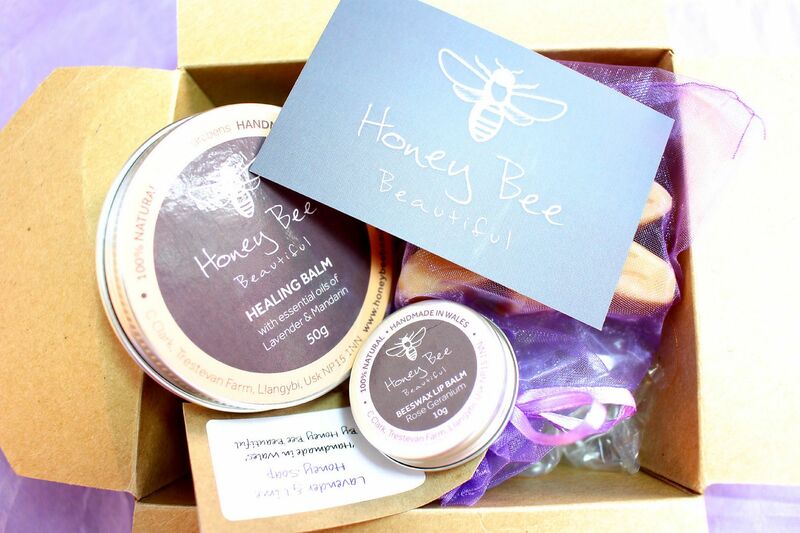 I made sure I packed my Honey Bee Beautiful Healing Balm, which is fantastic for any sore, dry and generally uncomfortable area's on your body, which can definitely be a problem when walking long distances. I also took my Honey Bee Beautiful Lip Balm and LUSH Helping Hand's Hand Cream, as recently both my lips and hands have been very dry and uncomfortable. I also packed a few lindt chocolate balls, just incase anyone needed a sugar kick, which definitley came in handy! Overall, I had a fantastic day and it was extremely humorous at times, especially with my sister telling me I should be in the alps and not walking up a muddy mountain. 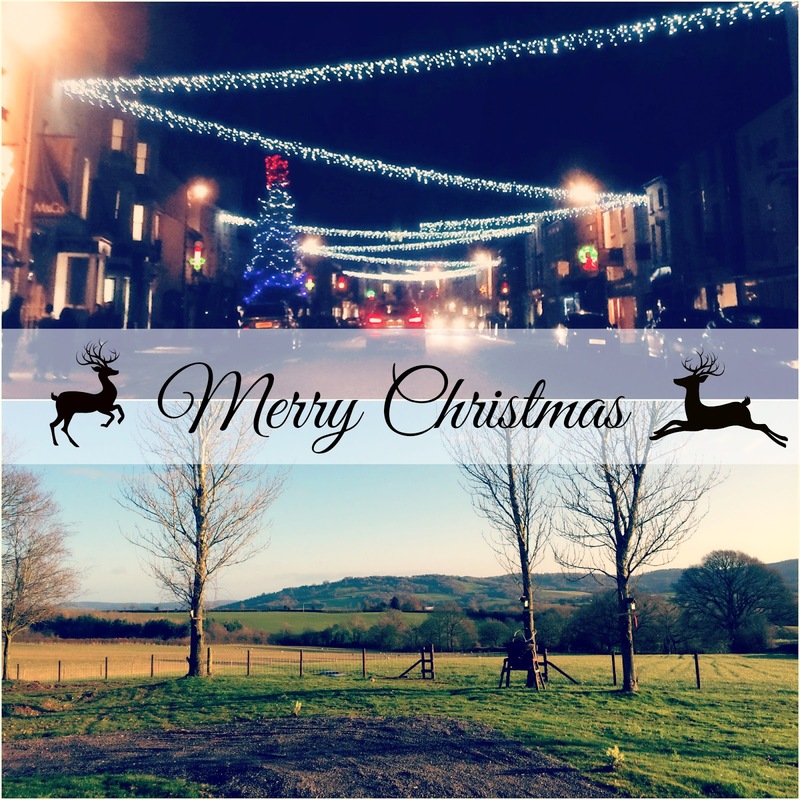 I hope you have enjoyed this slightly random post and I will be back very soon with an exciting post, which I think you lovelies will really enjoy! I would love to hear from you in the comments section below, do you have any Sunday traditions? The Monnow Valley, near Skenfrith, Monmouthshire is home to Petals of the Valley. Denise and Desdemona grow fragrant roses and companion plants, which help to create their beautifully unique Welsh Rosewater. Petals of the Valley use their own pure spring water and highly fragrant Rosa Damascena roses grown on their Monmouthsire based farm. 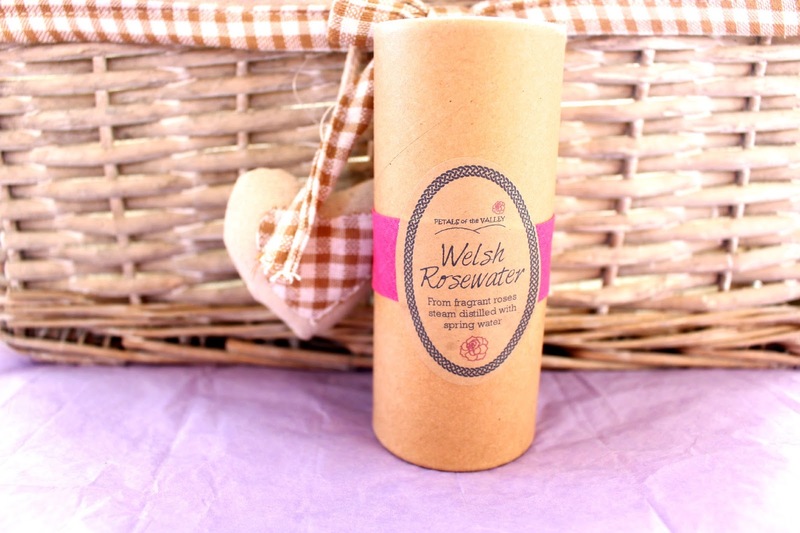 The Organic Welsh Rosewater created by Petals of the Valley contains no preservatives and the roses are steam distilled once, unlike industrially produced rosewater which can be distilled up to 7 times! If that's not enough then the Rosewater from Petals of the Valley's is believed to be first Rosewater in the UK to be approved as a food ingredient, which is pretty impressive! I'm sure you beauty lover's already know how amazing Rosewater is as a beauty product, and is used in many cleanser's, serums, moisturisers, lip balms and more! It's fantastic for skin ranging from sensitive and mature to Young and acne prone, which definitely makes it a little miracle worker! 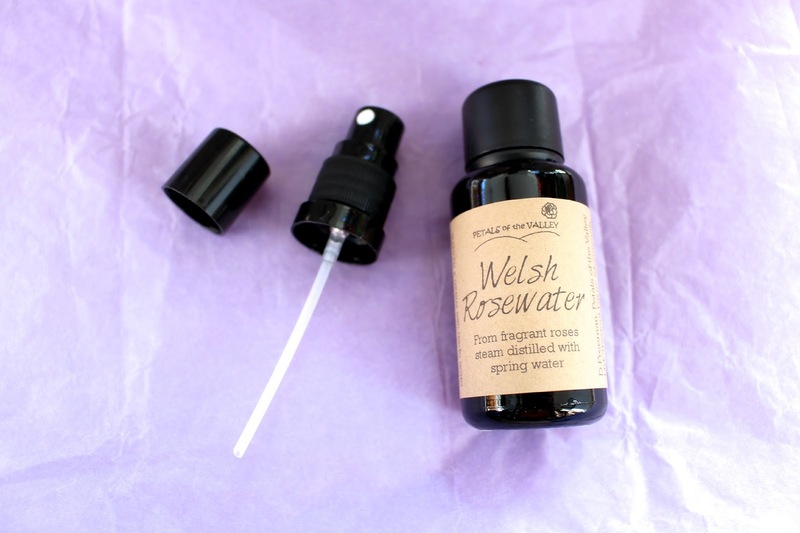 You might have seen me recently feature the Petals of the Valley Welsh Rosewater in my "Evening Skincare Routine" and it has definitely been a regular feature in my recent skincare regime. I have used Rose products for quite some time now, but this is the first time I have used Rosewater in its purest form and I must admit I'm loving it! I tend to spritz the Petals of the Valley Rosewater over my face just after cleansing or just before bed. I can't even describe how beautiful and natural it smells, which makes it even nicer to use! I also love how it makes my skin feel soothed and relaxed. Rose is well known for not only being moisturizing, but also being a great acne treatment! A few weeks back my skin was getting quite bad with those horrible under the skin type of spots. However, since using this product my skin has started to gain its luminosity back, with no sign of any pesky spots! 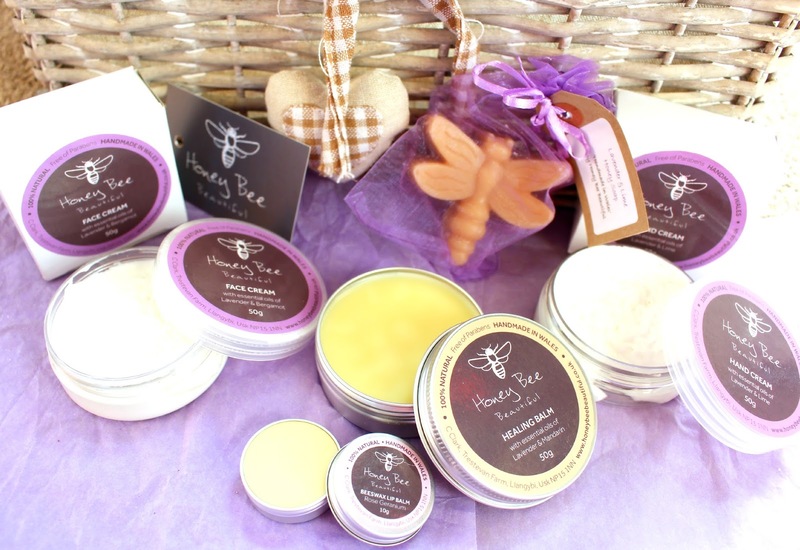 Honey Bee Beautiful are beekeepers and produce honey and honey and beeswax based skincare, candles and polish from their farmhouse in South Wales. 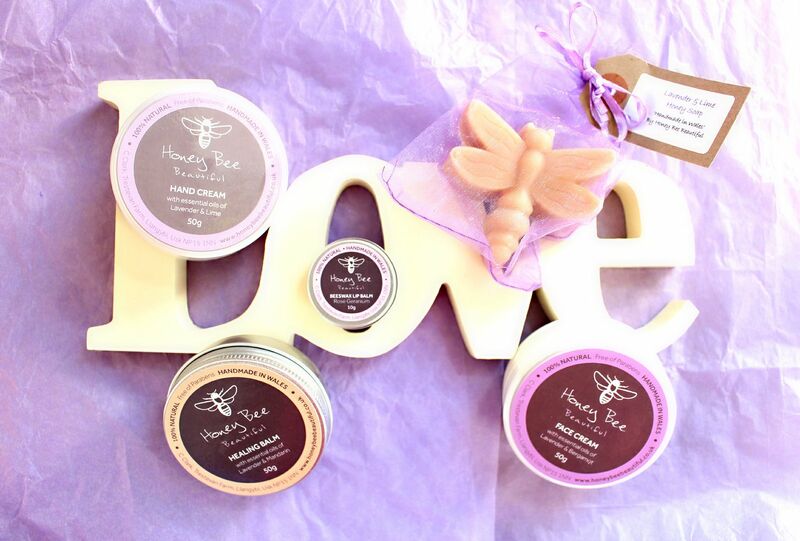 Each product is carefully and lovingly handmade using the finest quality natural ingredients from the bees at the Honey Bee Beautiful farm. Honey is well known as a miracle ingredient and gives products a wonderfully moisturising, healing and soothing quality. Honey is also a humectant, which means it attracts moisture and beeswax also provides a natural protective barrier for delicate skin! 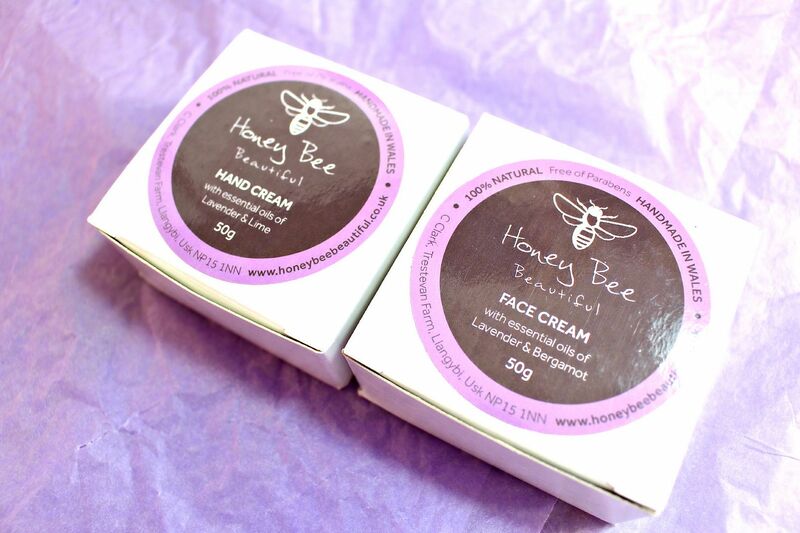 The Honey Bee Beautiful Face Creams come in two variations’ that are suitable for dryer and oilier skin types. I opted for the Lavender Face Cream, as I tend to be normal-combination in my skin type. I have been using The Lavender and Bergamot Face Cream in the evening and have been waking up with soothed and far less irritated skin. Lavender is well known for its anti-blemish properties and the combination of honey and beeswax make this an extremely moisturising and soothing face cream, perfect for Winter! Like the Face Cream you can also get the Hand Cream in different variations’ which is useful, especially if you like a particular scent more than another! I have been using the hand cream for around a week now and I have been really impressed by how quickly it sinks in, but more importantly how well it has nourished my hands! I have been busy moving the past few weeks, so it has really eased my sore and tired hands. I think this would make a great little stocking filler, as handcreams are perfect for sore wintery hands! 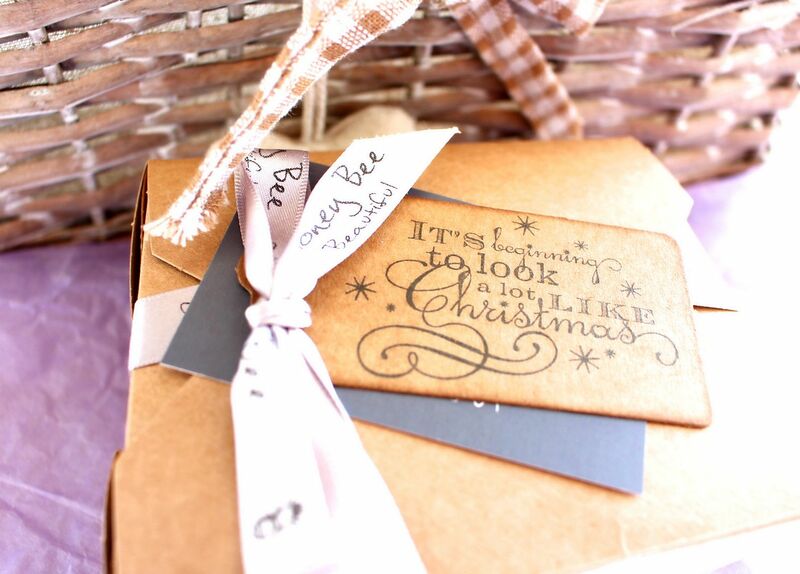 The Honey Bee Beautiful Gift Box is beautifully presented in a card box with an extremely cute tag which says “It’s beginning to look a lot like Christmas” I think this little touch is very thoughtful and makes it a great gift to give someone at Christmas Time. 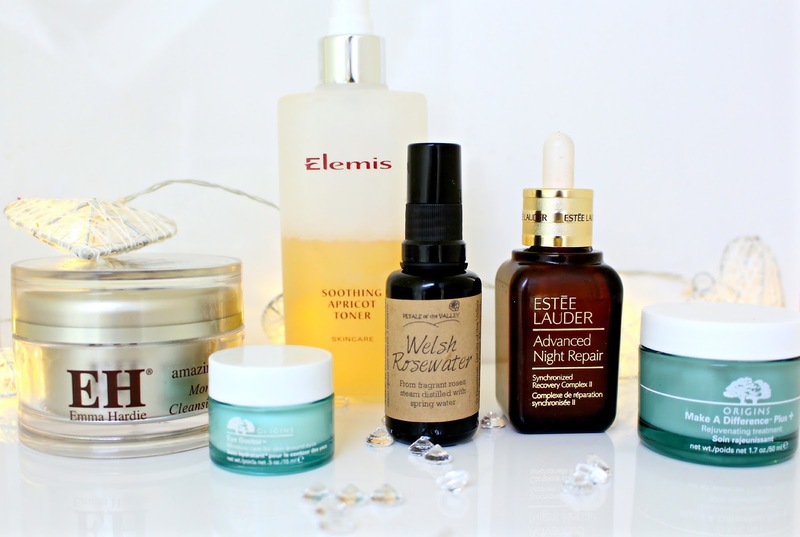 You get a great range of products, which are sure to help keep your skin moisturised and soothed throughout the harsh winter months! 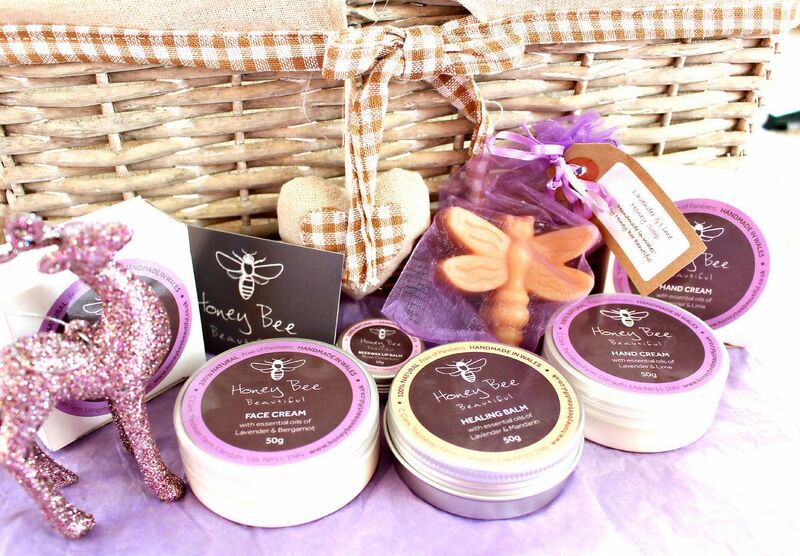 This would make a great gift for a friend, sister, mum, auntie, girlfriend or anyone who loves natural beauty! In the evening I love to opt for a cleansing balm as there is something so luxurious about laying back in the bath with a beautiful cleansing balm not only cleansing your skin, but also acting as a face mask! My favourite cleansing balm is the Amazing Face Morigna Cleansing Balm by Emma Hardie and I'm officially on my third pot now. After cleansing I always tone using my trusty Elemis Soothing Apricot Toner, which is also a third favourite of mine. I think I'm on my sixth bottle and after using other toner's I have always gone back to this one. Even if my cleanser hasn't removed all my make-up I can rely on this as the final step in my cleansing routine.. plus its also gentle enough to use around the eye area. Once I have finished with my toner I then move onto another hero product for me, which is my Estee Lauder Advanced Night Repair || I honestly can't get enough of this product, as it truly renews my skin and makes me feel like I've had a good sleep... which is pretty good as I suffer with mild insomnia. Serum's are designed to penetrate the deepest layers of the skins dermis, which is something a moisturiser can't do.. so I always make sure I use this in my evening routine. After using my Estee Lauder Serum I then apply my Origins Eye Doctor Eye Cream which is literally the most hassle free eye cream ever. I love how it is just designed to keep your eye area nourished instead of having unrealistic claims like a lot of eye creams do! Once I have taken care of my eyes I then move onto one of the final stages of my routine which is moisturising. I have been using the Origins Make A Difference Plus Rejuvenating Treatment for over a year now and nothing has rivalled it in my opinion. I'm a huge fan of its cream-gel formulae as its hydrating without being greasy, which makes it perfect for both morning and night use. 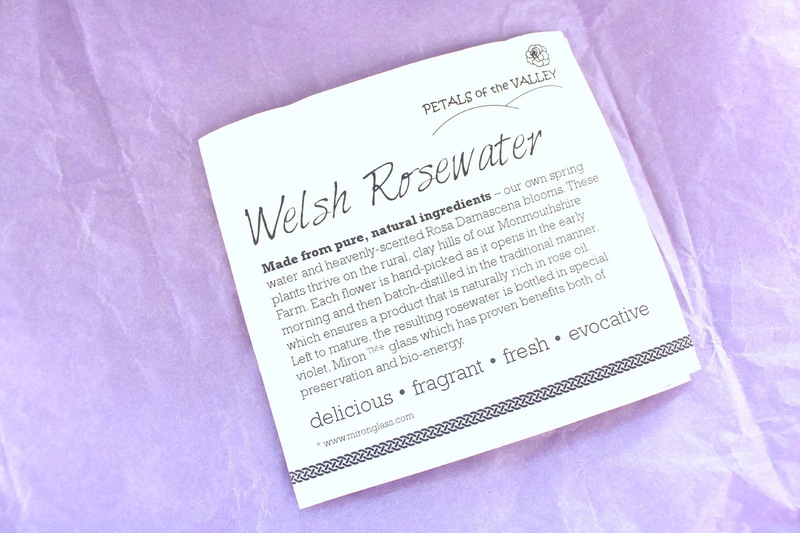 Finally, I have a new treat which I have added to my evening skincare routine and that is the Petal's of The Valley Welsh Rose water, which I use as a before bed treat to help moisturise and tone my skin throughout the night.